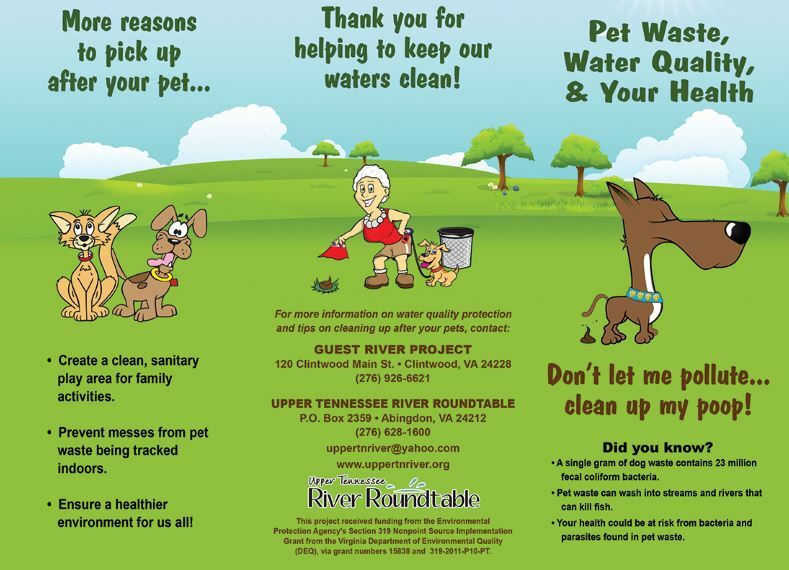 Upper Tennessee River Roundtable offers education and outreach programs and assists partners with their programs. Education activities address Virginia Standards of Learning. 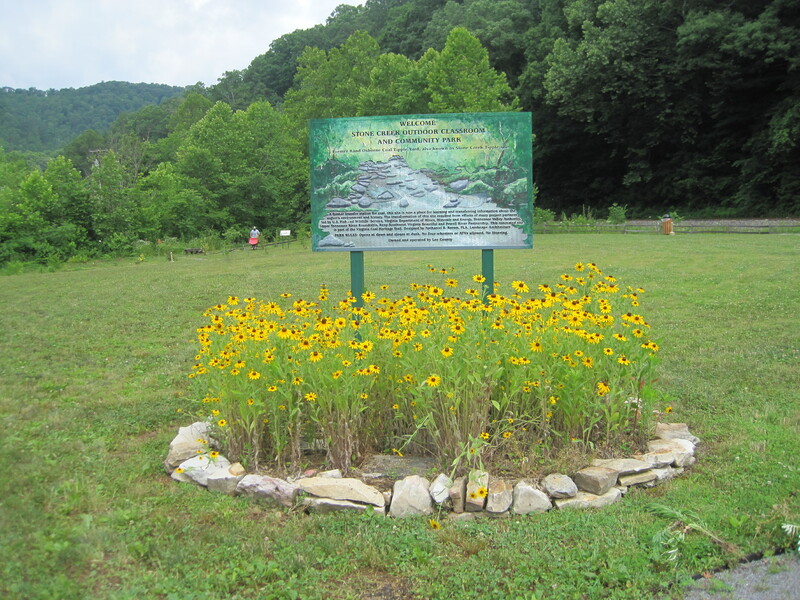 The Roundtable helped develop the Saltville Outdoor Classroom in Smyth County and the Stone Creek Outdoor Classroom and Community Park in Lee County. The Roundtable assisted with updates to the Clear Creek Outdoor Classroom in the City of Norton. ​Another lesson source is the newly developed website by the Clinch River Valley Initiative: www.teachtheclinch.com, which can be adapted to other watersheds. The Saltville Outdoor Classroom located in Saltville, Virginia offers eight learning stations and is available for school field trips. Be sure to visit the Saltville Library to check out the "Go, Play, Learn" bags with many activities for parents and children to do at the classroom. The following topics are featured at the classroom. Can you describe or give a definition for watershed? A watershed is land that drains rain and snow to a stream, lake, river, bay or ocean. We all live in watersheds. The larger watershed for our region is called Upper Tennessee River Watershed. ​Do you ever see animal tracks such as those in the photo? Can you figure out which animals made the tracks that you saw? Plants and trees are very important in nature. 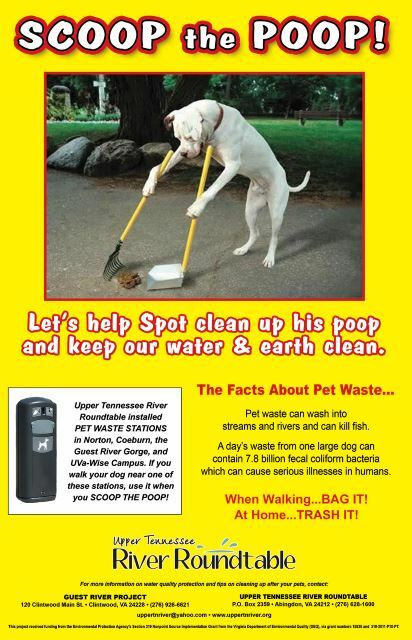 Litter is not only unsightly, but also littering is against the law. Hold onto all trash until you reach a trash can or a recycling bin. 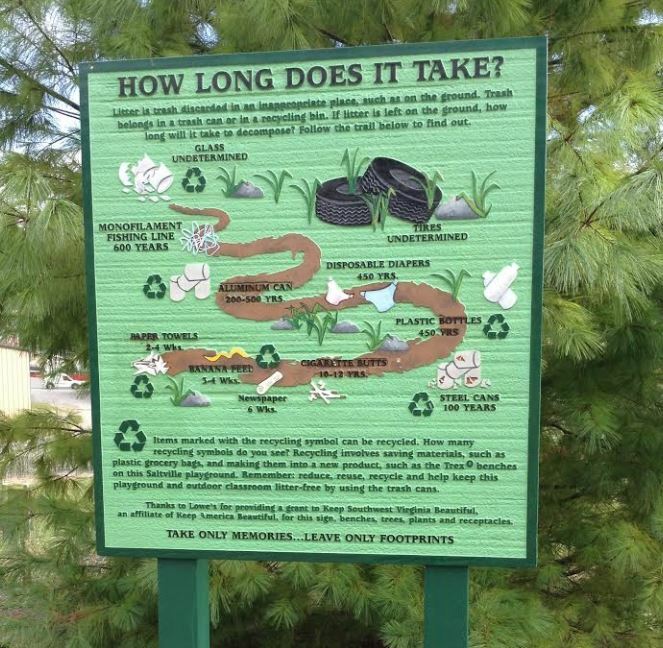 The sign in the photo shows how long it takes for litter to decompose, rot, or go away if left on the ground. Some materials, such as plastic, take a very long time to decompose. The Virginia Department of Environmental Quality offers a variety of lessons in "Pollution Solutions." 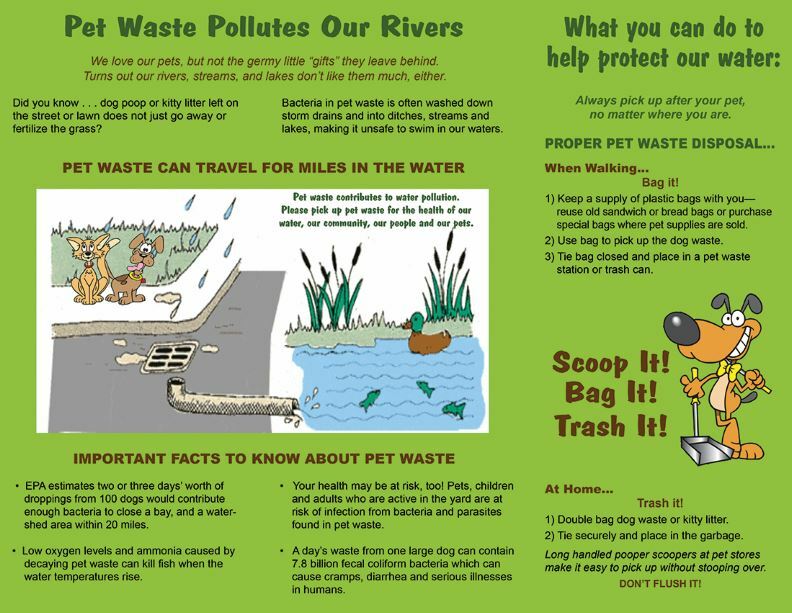 Did you know that your pet's waste can be harmful if washed into waterways? Click to download PDF of each. A key concern of the Roundtable is Acid Mine Drainage. The Roundtable created a flier that highlights the harm of AMD and also serves as a field guide for identifying water sources affected by AMD. Click here to download the flier in PDF format. BLUEFIELD, Va. — Students from Graham Middle School participated in an outdoor science class Wednesday morning at Graham Recreational Park. Cameron Hampton, 11, from Graham Middle School visited the different stations offered at the outdoor education program.